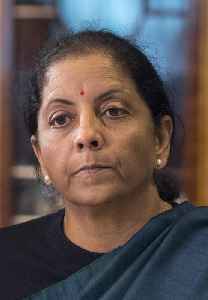 Nirmala Sitharaman is an Indian politician of the Bharatiya Janata Party (BJP), serving as the Minister of Defence since 2017 and has served as Member of the Rajya Sabha, upper house of the Indian Parliament, since 2016. Sitharaman is India's second female defence minister. She has served as the Minister of State for Finance and Corporate Affairs under the Ministry of Finance and the Minister for Commerce and Industry with independent charge. Prior to that, she has served as a national spokesperson for the BJP.